Splashtastic water toys, state-of-the-art aquatic fitness equipment and renovated changing rooms will be introduced to the region’s swimming pools thanks to a £1.5m investment from Durham County Council alongside £540,972 funding from Sport England. The pool at Aycliffe Leisure Centre is one of four which will benefit from the lottery-funded Swim Local Pilot, which was created following feedback around local swimming experiences gathered at 16 focus groups and through a satisfaction survey. Customers’ views on swimming and the barriers they face in taking part in activity were used to shape leisure centre refurbishments, new programmes and sessions. As one of 12 Swim Local Pilots across the country, the project is aimed at increasing participation in the sport and delivering better outcomes for physical activity across County Durham. The research and insight helped identify who from local communities would swim more if the right activities were on offer. This includes families who want to swim for pleasure and fun, people who are thinking of using swimming to improve their fitness levels and water-based fitness classes, which offer an alternative to traditional studio based activities. Pools included in the pilot project along with Aycliffe include Chester-le-Street Leisure Centre, Peterlee Leisure Centre and Woodhouse Close Leisure Complex. The project begins in time for the summer holidays with exciting new products for all the family to enjoy. Newly-introduced inflatable sessions will see the county’s pools taken over by a giant inflatable obstacle course aimed at eight to 14 year olds that are sure to provide lots of laughs whilst trying to complete the challenge. 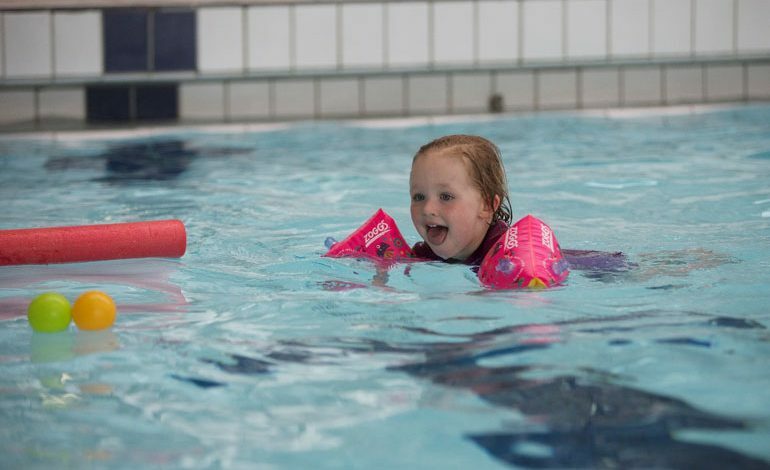 Aquafun sessions will see new and updated pieces of equipment such as rafts, floats and water toys including floaters, sinkers and balls that are not only fun, but will help develop aquatics skills. The sessions will also provide families and children the opportunity to play new and exciting games. Families will also be encouraged to spend some quality time together as part of adult and child sessions where they will be able to play and invent their own games in the water and meet Brock the badger and his friends who will be learning to love water at the same time. The roll out will continue over the next 12 months and, later in the year, the funding will be used to transform changing rooms, create new reception areas and introduce water-based fitness classes including spinning and trampolining. Cllr Ossie Johnson, Cabinet member for tourism, culture, leisure and rural issues, said: “Swimming is already the largest participation sport in Durham with many of our residents swimming at least once month, and we are delighted that we now have the funding thanks to National Lottery players to help this number grow. Lisa O’Keefe, Sport England’s Director of Insight, said: “Sport England is proud to be providing funding and support to Durham County Council to help more people get active through swimming. “A lot of research has gone into the development of the Swim Local projects to make sure we’re giving the local community what they want and need. We know swimming is one of the ways many people prefer to get active.